Bond-Tastic is a terracotta orange/brown. It's a very unusual color and I wasn't really sure about it at first but the magnet really magnifies it, revealing a dark and warm base. The effect isn't the strongest but it's still very visible. This in one coat plus topcoat. Con-Fused? 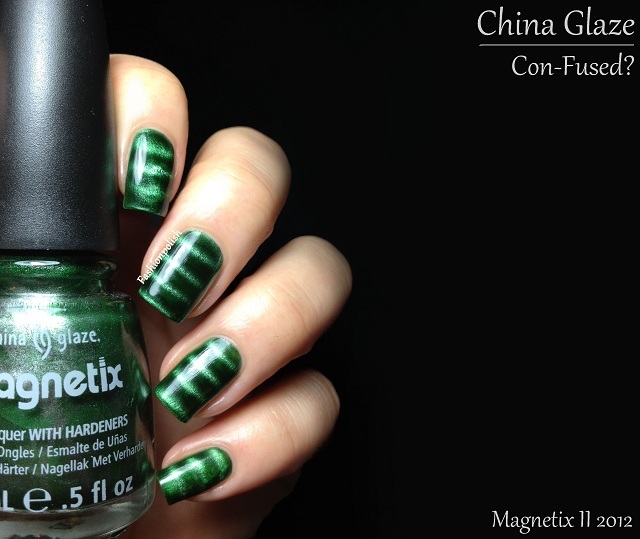 is a dark pine green that also reveals a warmer base with the magnet. The effect was much stronger here and I actually really loved this green on me. This is also 1 coat plus topcoat. 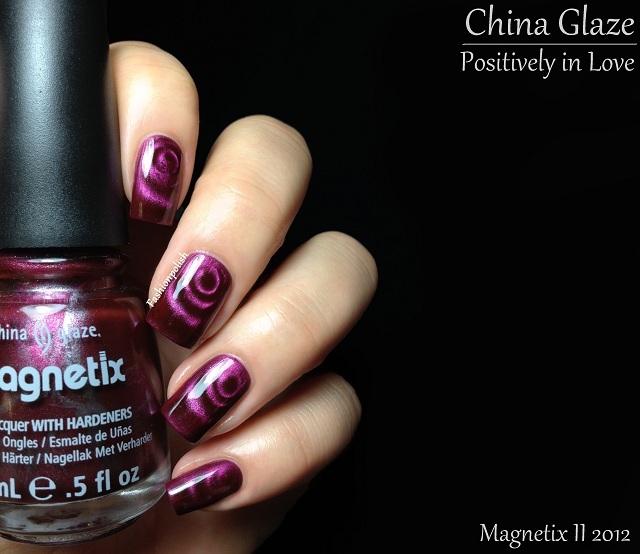 Positively in Love is a slightly cool toned magenta. 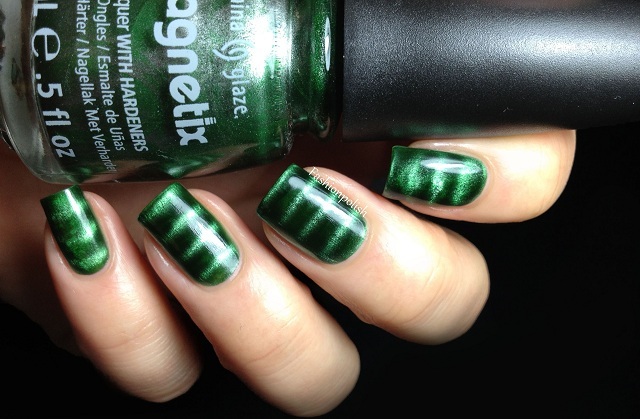 The magnetic affect was also really strong but the polish was a little more sheer than the others and required 2 coats. Get Charged is a dark greyed out purple. I really love this one because it's a more wearable color on a daily basis. The effect is also quite strong and the polish very pigmented. This is 1 coat plus topcoat. Gold Fusion might very well be my favorite gold magnetic ever. 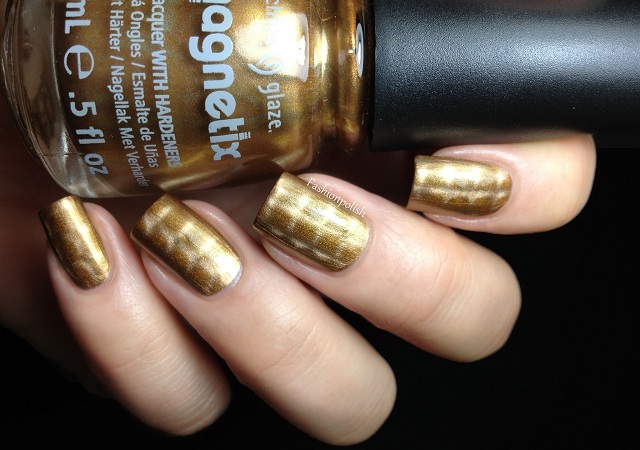 I love how the magnet creates a cool vs warm gold look. This is, as you guessed, also 1 coat plus topcoat. Sparks Will Fly is a medium blurple/blue. This color is so beautiful in real life! 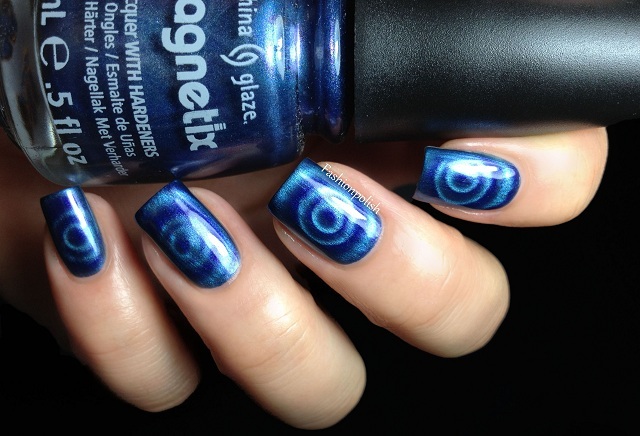 It also reacts really well to the magnet and creates a really strong effect. I used 1 coat plus topcoat. 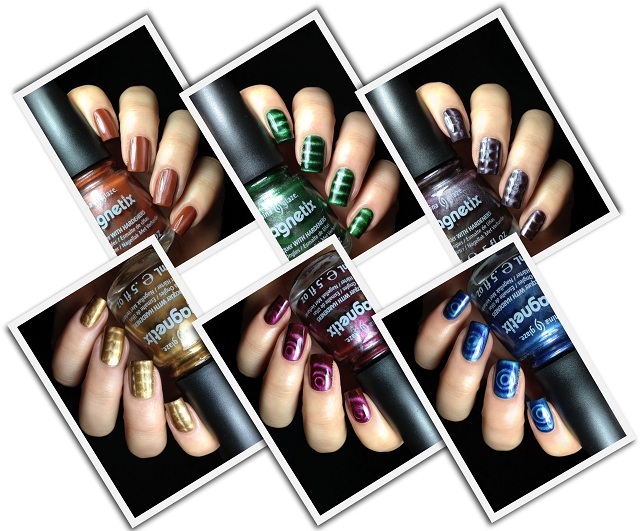 Formula was truly perfect on all 6 polishes, very pigmented and easy to work with. The magnet is really outstanding and creates dramatic looks within just a few seconds. Besides from the grid pattern (which I love! ), you can play with it and achieve different designs by changing its placement on your nails. 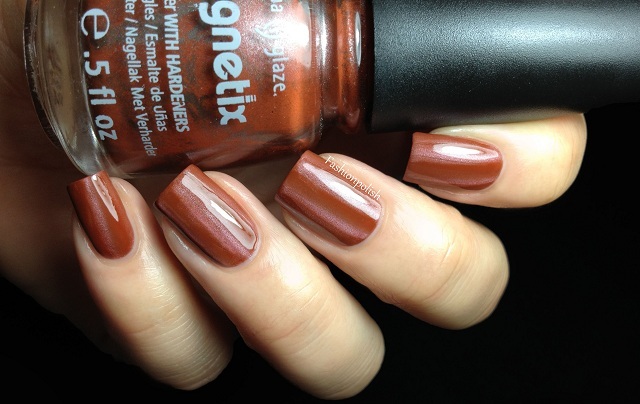 One quick tip : wait until the polish is dry to apply topcoat or you will smudge it. 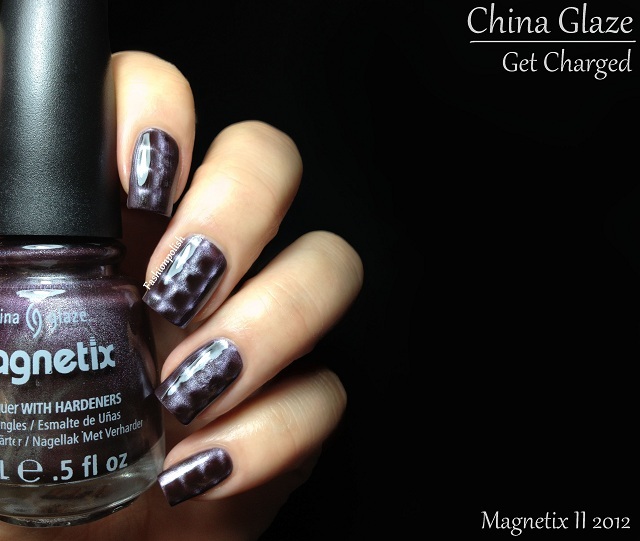 The China Glaze Magnetix II collection is already available online and at local distributors worlwide. 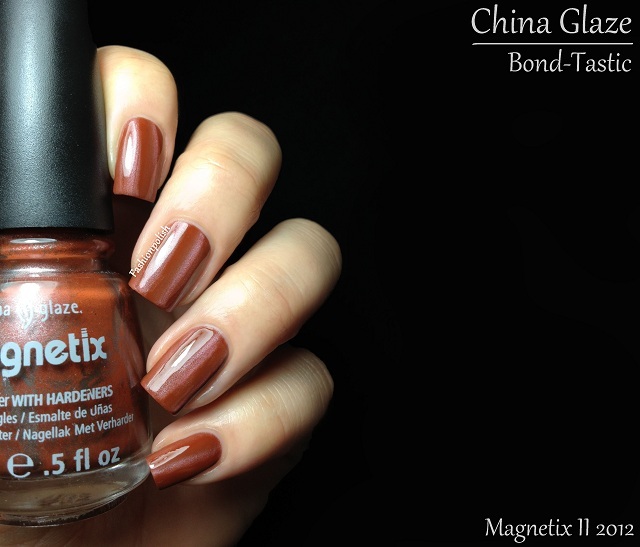 China Glaze is free of DBP, Toulene and added Formaldehyde. 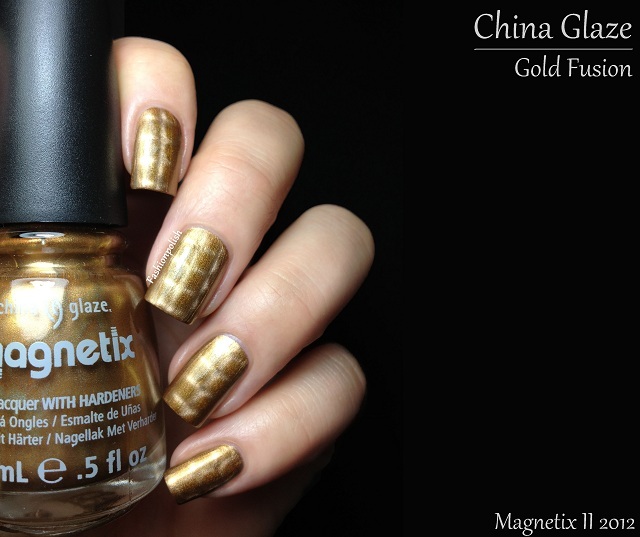 For more information, please refer to chinaglaze.com or China Glaze on Twitter / Facebook. I really love the new magnet patterns! I like the green and the blue best! However, I have several magnetic polishes and never reach for them, because in the past I could never get the design right. Maybe it's me, maybe it is the weak magnet, but it never turns out nice. Maybe I should give those China Glazes a try! I knew I was going to buy this magnet, but after seeing your swatch, I will have to get Get Charged too. I really don't like magnetic polishes. Same with crackle. It's not mine. Hmm I'm still not sure I like magnetic polishes! I don't know what it is! Pretty post and nails! I neeeed the blue one! Beautiful nails you have there! 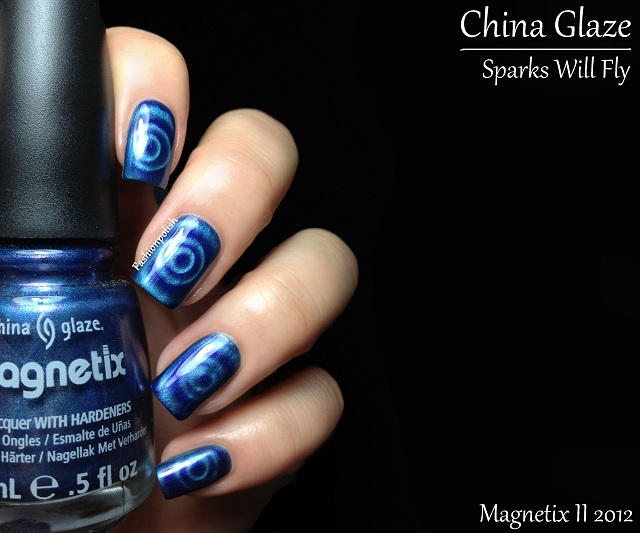 I'm usually not a fan of magnetics, but Sparks Will Fly is gorgeous - of course, you make EVERY polish look gorgeous! 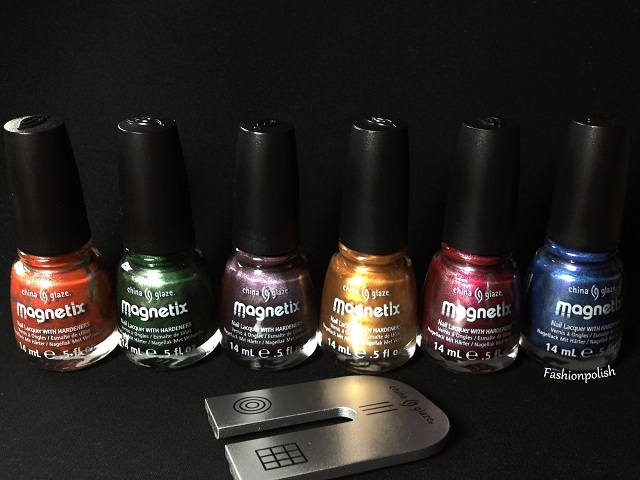 How do you feel about magnetic polishes? Personally I feel that they are so overdone now and I find them boring. These colors are move vibrant than I expected. Your pictures, as always, are beautiful. I love your swatch photo's!! 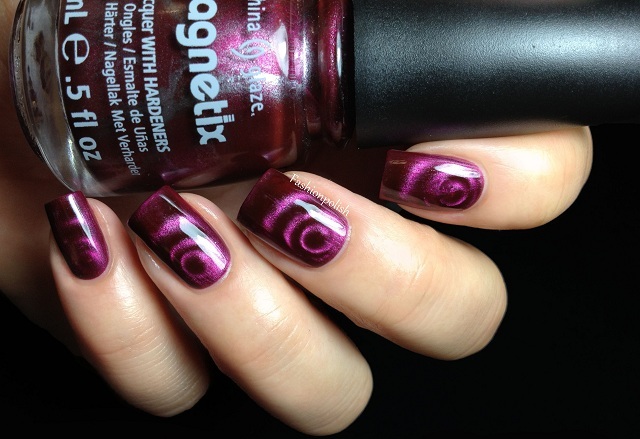 OMG I Adore Magnetic Polishes!!!! I love magnetic polishes!! I just picked up Get Charged, Con-fused and Bondtastic from Amazon. The beautiful blue is next on my list! !